During the hot, dusty days of summer, we also spent many hours walking across those fields, as he chopped the poisonous thistles that could kill the cows. He would point out the beauty of the single cottonwood tree, the vastness of the skies, and the scarcity of water in the small creek that trickled slowly through the farm. During the stormy nights in spring and summer, he also taught me what the brown, boiling skies meant. My grandmother would rustle my sister, my cousins, and me out of our beds to head out the door, hurry across the side yard and down into the earthen root cellar. There, we sat next to her pickles, sauerkraut, and potatoes while we all anxiously hoped the tornadoes would not take the house and barn. No early-warning system existed then; my grandfather and father would stand at the top of the cellar and watch, rushing down the stairs when the winds grew too fierce for them to keep the door open. So it wasn’t surprising to me when, in 1972, my undergraduate studies were shaped by a course in environmental ethics co-taught by Wes Jackson, founder of The Land Institute and an early leader in the sustainable-agricultural movement, and Wayne Montgomery, a professor of religion. The course gave the name “environmentalist” to my family’s sensibility about the land. It also exposed me to the importance of bringing disciplines together to address what I took, and continue to take, to be the greatest challenge we face in terms of the survival of the planet and therefore of the people who inhabit it. Many years have passed since I took that course or walked the Kansas prairies with my grandfather, and like most of us at Swarthmore I understand now, in a way I did not then, that issues about sustainability are incredibly complex. This is especially true when necessary short-term survival in a community competes with necessary long-term changes in the ways we approach and affect our environment. This issue of the Bulletin provides an overview of sustainability efforts on campus and in the livelihoods of some alumni. Like many colleges and universities across the country, we are working hard to educate the next generation in this critical area. They will most likely be the ones to discover alternative energies, pass appropriate policies, express cultural values that support sustainability, and ultimately, lead people to embrace sustainable health for themselves and the larger community. One of the most important things we can do now is ensure that our students attain a sophisticated level of environmental literacy regardless of their field of study. I am pleased that we have a strong minor in environmental studies, and that our students can take Tri-Co courses at Bryn Mawr and Haverford colleges in this area as well as others. The future of the earth requires all of us to not only become fully informed but also actively involved in changing personal, cultural, and political practices that have an environmental impact. Swarthmore is diligent about its own efforts to make the campus as energy efficient as possible. Thanks to the generosity of a donor, last summer we began to replace the HVAC system in Parrish Hall to make the heart of our campus a responsible symbol of environmental efficiency. This summer also saw the construction of our fifth green roof, with a sixth on the way next year. 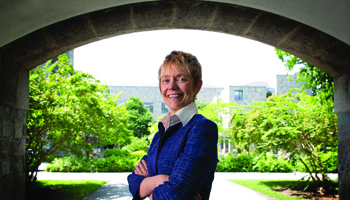 The College’s Sustainability Committee—under the long-term leadership of Professor of Engineering Carr Everbach, and guided by current co-chairs Assistant Professor of Chemistry Alison Holliday and Ralph Thayer, and composed of students, faculty and staff—is the primary group that advises on environmental sustainability policy and practices. In 2010, on the recommendation of the committee, I signed the American Colleges & University Presidents’ Climate Commitment on the College’s behalf, joining some—but not enough—leaders in higher education in accelerating educational and operational efforts to address climate change, including a pledge to develop a Climate Action Plan for the College. Professor of Biology Rachel Merz and Ralph Thayer are leading a committee of students, staff, and faculty to develop this plan, which will be presented to the community this semester. Alumni around the country and world are demonstrating leadership in areas related to sustainability. I have learned from many of them just how complex this issue really is. The alumni who teach environmental studies elsewhere urge that we encourage our students to pursue careers in sustainability. Alumni working in businesses relating to sustainability or in the oil and gas industry advise me to make the campus as energy efficient as possible, because they recognize that we will continue to be dependent upon fossil fuel for some time to come. Alumni who are activists push us, and rightly so, to do more. 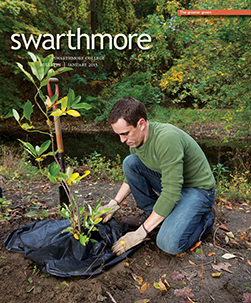 Swarthmore, like similar colleges, is intentionally utopian in its attempt to create an “ideal” culture in which we steward our land and resources in the most sustainable way. Places that model utopias and confront, honestly, the possible dystopias due to climate change are important for our culture. Despite our common commitment to sustainability, I do not want to suggest that everyone at Swarthmore is in agreement about the next step on our journey. For instance, some believe that the College should divest from fossil-fuel companies while others of us think change should come about through activism aimed at long-term policy changes at the state and federal levels. We might ask whether the South Africa divestment effort or the American civil-rights movement is a better model to effect large-scale changes to secure the future of the earth. Is there a model that we could help develop that is unique to this particular crisis? As always, we will need to engage in robust discussion to determine the next, best steps. My family no longer inhabits our Kansas farmland. Most have moved west to the Rockies. It seems that plains dwellers often become mountain lovers. The plains and the mountains both give us a view, provide a horizon, and let us see with our hearts and our eyes what life is but also what it could become. Now I live in the garden that is Swarthmore, and, as a scholar of religion, I cannot help thinking about what gardens often represent in religious literature. They are the places that nurture moral imagination, places where the good, the true, and the beautiful are portrayed. But no matter where we live, be it a place of beauty or, tragically, a place where the land is being destroyed, we need to actively pursue sustainability in our personal, cultural, and political practices. We must, as my grandfather said, take good care of the land because our lives, and the lives of the world’s children, depend upon it.